It takes time to find out if people really like the drinking water produced in our water shops. 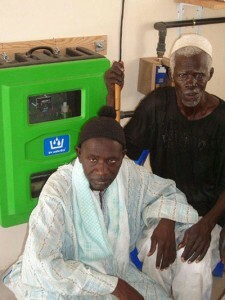 More than a year ago we installed a watershop in Walalane, situated in the ‘Sahel’ region. In the water shop rainwater is purified and sold to people by a local entrepreneur. He takes care of the operations and maintenance. 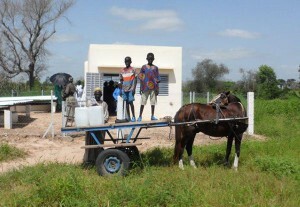 The rainwater is sold at a price of 0,007 euro/litre to families earning a maximum of 4 euro/day. To Western standards the water price of 0,007 euro/litre seems to be low, but given the fact that drinking water is also sold by the ‘Département de Hydraulique’ at 1/20 th of our sales price (0,00035 euro), indicates that our water is relative expensive for the people. Nevertheless already more that 23% of all the people living in Walalane buy our water and 27% of our customers are coming from localities situated up to 7 km away from the UV Watershop. The upper numbers proof that the water produced with the RainCAP and UV WaterBox are appreciated to a large extend. 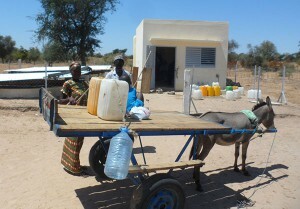 People are willing to pay for high quality drinking water and are willing to walk/drive up to 7 km to buy water at our watershop. If you want to find what the role of AAWS was in achieving this results, feel free to contact us.